This didn’t make sense until I realized they meant ‘your’ not ‘you’re’. See, indifferent-grammar-users? It does make a difference. I know, in a way it’s comforting to know that even back then, before the Internet, people didn’t know how to spell. Hmm, wouldn’t that be nice? 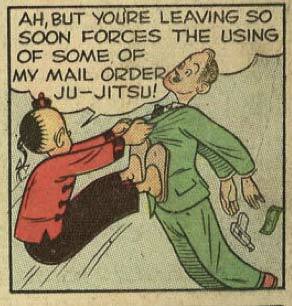 If all the mail-order crap that used to appear in kids’ comics actually worked as advertised? Is that his mouth or a Hitler mustache?